WordPress has become one of the most popular blogging packages on the Internet; this is largely due to its ease of use and its object oriented design which allows the user to easily extend its capabilities in the form of WordPress Plugins. The WordPress plugins repository is a high-availability set of development tools — a wiki, version control using Subversion, and bug tracker — that aims to nurture the active WordPress development community. 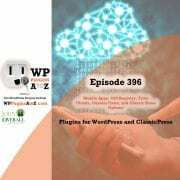 Plugins are tools to extend the functionality of WordPress. Plugins offer custom functions and features so that each user can tailor their site to their specific needs. Plugins are one of the most valuable elements of WordPress as a platform. You can download a fresh version of WordPress with the plugins you select, or just a zip of all your favorite plugins. More and more plugins are starting to use AJAX techniques. For any WordPress user, plugins are essential. Luckily there is already a few plugins out there for that, but sometimes your readers will suggest something that has yet to be implemented as a plugin. Semiologic CMS is a set of plugins and themes for WordPress that work together to turn a WordPress blog into more of a content management system. Each plugin is activated separately, so if you want to use a couple of the plugins, you can do so without running the plugins you don't want. Tags in the Head is a WordPress plugin that attempts to make your website both more machine and human readable by using the ‘Tags’ you specify as META keywords in a page’s header. When using this plugin, you can use the WordPress' categories as tags — no additional tagging plugin is needed. Some search engines are supposed to love this tag, so I guess we should, too. This plugin is extremely easy to install and it will create a dynamic Meta Description Tag for every page on your blog, based on post excerpts or on the first words of the page. WP-FLV is a plugin to help you add flash video to your WordPress site. It holds the URL to your Flash Video file. For instance generate a list of video links rather then show the player. It was really easy to get this running, and I think it looks more professional then most of the non-free flash video players. It is easy to simply pop it up, but its hard to specify the sizes of the windows they open in, especially when all the videos have different resolutions. Adsense Deluxe allows you to automatically insert Google Adsense with ease. Adsense-Deluxe allows you to test your Adsense styles without having to edit your WordPress templates. There are a lot of ways you can add ads to your WordPress blog. Google Adsense has become the most popular online contextual advertising program. WordPress allows bloggers to easily integrate Google Adsense inside wordpress using plugins. Social Bookmark Plugin : Make it easy for users to bookmark your posts in del. Socializer is way to submit your post to all of the social bookmark networks at once. It include 37 social bookmark networks (digg, de. Bookmark Me by Denis de BernardyLists links to common social bookmarking sites. This is an excellent way to promote your articles on one of the most popular social bookmarking sites around. This plugin is very useful for handling sudden bursts of traffic coming from social bookmarking sites like Digg and Slashdot. These icons link to social bookmarking sites where readers can share and discover new web pages. There are hundreds, if not thousands, of WordPress plugins available for download. Top 10 Underrated WordPress Plugins those plugins are certainly awesome, but there are many others out there that can be life savers, and people often neglect them.